I don`t even remember the last time I bought a bus ticket or a train ticket, or used coins for a drink machine. The technology isn`t all that new in Japan, it`s not even cutting edge. But it`s become part of the way of life. Touch and Go! Just tap the card and you don`t have to worry about counting your money or having to go buy a ticket. This really helps when you are rushing to catch that last train! If you look at the photo above you will see that I have a SUICA card. 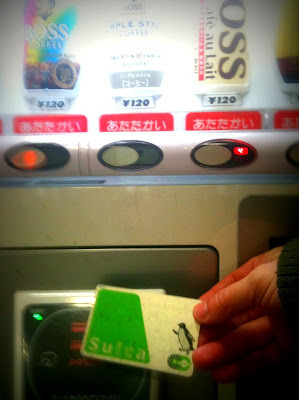 I charge it at a terminal with cash and then use it as digital money for my transportation mostly, but I also use it to buy food and other items at stores that offer the SUICA service. There are other digital currencies available for cell phones and other cards types, but SUICA is no doubt the most-widely used being the first of its kind to appear in 2001. It is interesting to see how technology is driven by our need for convenience. Life is fast-paced in urban Japan, and so technology plays a big role in saving time and providing convenience to the population. When I was growing up, I remember thinking about the idea of digital currency and wondering if I would really see it in my lifetime. Well the future is now and I`m actually living it out! OH the fun the futurist pretribbers could have with that one! LOL..
What happens if you lose it? Is it safeguarded somehow? It certainly makes one think of the "End Times"
them to put a stop on it and reissue another card with the last recorded balance. At this point there isn't any kind of safeguard technology to go with it. It's basically like cash, if you lose it you are probably out of luck. wow that is scary! Cool but scary if you lose it! highly sophisticated technology that helps all human needs presented in a practical and easy to get ..
You said it right...really is interesting to see how technology is driven by our need for convenience. We have gone beyond our means and worked really hard into making sure we stay within our means without working too hard. Sarath, thanks for comment ! LOL Oh the ironies of life. Nice information..Alternative way to keep your money save beside bring it cash..